For several hours one morning a couple weeks ago, at a gathering of the American Economic Association, the architects of the present monetary regime pontificated about the Federal Reserve’s crucial role in keeping the Main Street economy on the “straight and narrow” to permanent full-employment prosperity, world without end…. It all sounded so serious and studious, analytic and earnest. It’s all a bunch of nonsense. In the era of Bubble Finance, Benjamin Bernanke, Janet Yellen, Jerome Powell, et al., have been rendered both clueless and useless when it comes to Main Street. Econometric equations, economic laws and axioms, historical knowledge, and data-mining are pointless. What drives the economic cycle is finance. And what drives finance is the politburo inside the Eccles Building. I contend that what happens on Main Street is entirely the result of labor, management, and capital doing their thing. That’s often despite headwinds and obstacles thrown up by the state – especially its central banking branch. After all, the Fed cut interest rates from 5.75% on the eve of the 2008 crisis to zero. And it held them there for the better part of a decade. They violated every canon of sound money – and common sense – known to financial history. And, still, this foolhardy experiment – what amounts to official monetary fraud – “stimulated” the weakest recovery ever recorded. Yet just the opposite actually occurred: The deepest post-war recession begat the shallowest post-war recovery. We’re now 115 months past the Great Recession. And real gross domestic product (GDP) is just 18% higher than it was way back in the fourth quarter of 2007, average growth of just 1.55% per year. That’s 11 years of stall-speed expansion. By contrast, during the “guns and butter” expansion of the 1960s, cumulative peak-to-peak real GDP growth was 52%. That’s 4.2% per year. 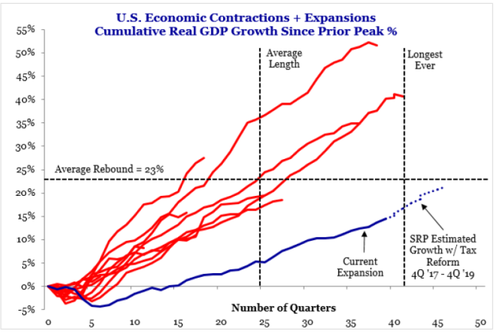 At a similar point in the 1990s expansion, cumulative real GDP growth from the prior peak stood at 41%, representing annual growth of 3.5%. The blue line in the graph below tracks the true pittance of growth that private capitalism has managed to eke out since the pre-crisis peak. That advance is so miserly precisely because the U.S. economy was freighted down by the massive $70 trillion aggregate debt burden fostered by Fed policy. That’s to say nothing of the punishing blows administered by Corporate America in the form of inflation-driven offshoring and Wall Street supplicating financial engineering. These untoward macro forces are the direct consequence of the Fed’s massive intrusions in the financial markets. The Fed’s massive exertions since Lehman Brothers’ meltdown in September 2008 haven’t moved the needle much on Main Street. That’s obvious. Our monetary central planners only see Wall Street. Its “stimulus” keeps capitalization rates and bond yields below their natural “market clearing” levels. And, according to these three stooges, there are no bubbles – or even serious indicators of financial instability – in sight. No crash, no recession is imminent.